Licorice is a relatively safe herb that can be used to help our dogs with various health issues. Licorice has anti-inflammatory properties and has pain relief and anti-itching properties. It also lubricates and soothes mucous membranes. Since Licorice is an effective anti-inflammatory due to the presence of Glycyrrhizin, which stimulates the adrenals, it is useful for treating Addison's disease in dogs. Due to its anti-inflammatory functions and corticosteroid-like actions, licorice is effective in helping relieve pain, itching, and inflammation without the side effects that can be brought on by corticosteroids. 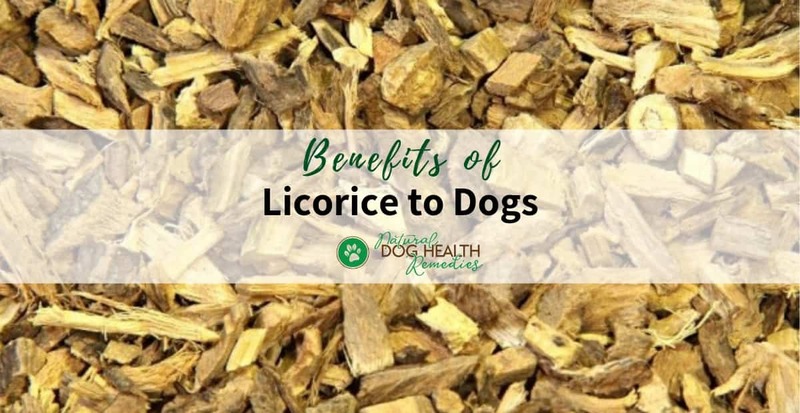 If your dog has inflammatory issues, such as arthritis, joint pain, or skin problems such as eczema, or atopic dermatitis, licorice is a good herb to use. This herb also acts on the digestive system by promoting cell growth and alleviating ulcers. Like slippery elm, it soothes and protects mucous membranes and is good for the gastrointestinal and upper respiratory tracts. For example, licorice benefits dogs with stomach ulcers, and the herb has long been used to alleviate coughs and ease discomfort brought on by bronchitis.